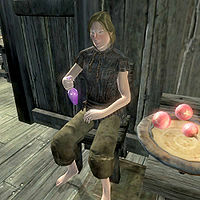 Roxanne Brigette is a Breton pauper and skooma junkie who can be found in Bravil's infamous Skooma Den. According to herself, she is there to help the other residents get through their addiction, but her lifestyle suggests that something must have gone horribly wrong along the way. Now a full-time skooma addict, Roxanne lives her life in a constant skooma-high and never even sees the light of day. She sleeps in the upstairs area every night between midnight and 6am. She starts the day with two skooma-free hours, but at 8am she pulls out the bottle and starts drinking. She keeps going for a whopping twelve hours until 8pm, when she just staggers around the Den until her bedtime at midnight. Life in the Skooma Den is an easy one and Roxanne's wardrobe reflects just that: she is clad in a sack cloth shirt with matching pants and bare feet. She carries around her stash of skooma (15 bottles), her indispensable mug, and a small amount of gold. If you approach her during her drinking hours, she won't even bother putting the bottle down. She will, however, still try to convince you that she is there to help the other residents: "Hello. I'm Roxanne Brigette. I help the boys. They get a little squirrelly sometimes, find it hard to cope. So I help out." When asked about Bravil, she will reveal the embarrassing truth about Count Regulus Terentius' unpopular son Gellius: "Me? I got no problem with Bravil. Lovely town. That little prince, the count's boy, he's sweet with the sugar. EEEA-sy Street, all the way." Like all other inhabitants of the Skooma Den, Roxanne can be killed without incurring a bounty as long as no other people (besides the other skooma addicts) are around. This is a great way to join the Dark Brotherhood.